Born and raised in Cleveland Heights, Ohio, Neal Smith has been playing drums since the age of five. By the time he completed high school he had achieved a remarkable list of performance accomplishments and earned an impressive array of awards, scholarships, and honors. With the support of his family, Neal continued his studies at the Oberlin Conservatory of Music where he received a Bachelor of Music in Jazz Studies and Performance, the first African-American to earn a degree in Jazz Studies from the Conservatory. In addition to his academic training, Neal has studied with Vernell Fournier, Greg Bandy, Paul Samuels, Tom Freer, Bruce Collie, and Gordon Gottlieb. Neal performs regularly in clubs and concert halls, at colleges and universities, and at U.S. and International Jazz Festivals. Neal leads his own group, which performs original compositions as well as classic arrangements of jazz standards. Neal also performs regularly with internationally recognized artists and has shared the stage with the likes of Tom Harrell, Anita Baker, John Hicks, Monty Alexander, Donald Byrd, Kenny Burrell, Sonny Fortune, Jimmy Owens, Eddie Harris, Isaac Hayes, Gary Bartz, Benny Golson, Donald Walden, Frank Morgan, Brian Lynch, Benny Green, Cyrus Chestnut, Frank Foster, Dewey Redman, Mark Whitfield, Ronnie Mathews, Rufus Reid, Wendel Logan, James Moody, Marlena Shaw, Charles Davis and Vanessa Rubin. Neal also leads his own group, which performs original compositions as well as classic arrangements of jazz standards. Beyond performing, Neal loves to teach developing drummers. 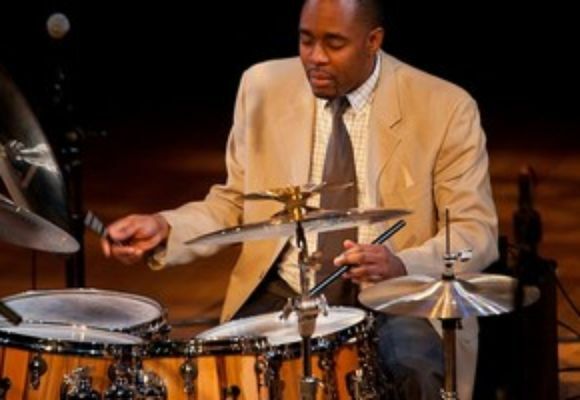 He is currently a Professor at Berklee College of Music (http://www.berklee.edu/people/neal-smith. Recognizing the need for a record label that focuses exclusively on the production of jazz recordings, Neal founded the NAS label in 2004. Neal Smith endorses Sonor Drums, Zildjian Cymbals, Evans Drumheads, Vic Firth Sticks/ Brushes, Hamilton Stands and Axis Pedals.